--Jewish weddings start on time, this is something I learned is not necessarily true for other religions, or maybe just other people. --our synagogue is Reform, therefore it is not necessary to have your shoulders covered, but you will see many people who do choose to bring a sweater or wrap to cover their shoulders for modesty sake. I'm the bride and I'll be in strapless, so anything goes. --The men will be given a kippah to wear - a head covering. If they feel uncomfortable wearing it, they don't have to, but it is encouraged. Now, my Auntie has lectured me for years about not trying on hats or wearing things that have gone on other people's heads. Never fear - these are brand new kippahs emblazoned with 'Jeremy and Kara's wedding' inside. Lice not included. --The wedding will be inside as Minnesota Jewish weddings cannot be outside. This is not at all a religious thing, but rather, an agreement between the Minnesota Rabbis who don't want to potentially freeze their patooties off when some crazy bride decides to have a 'Winter Wonderland' wedding outside in January. --It is customary to send a gift to the bride's parent's house rather than to bring it to the ceremony. This is not done for any religious reason, simply because Jews are practical people and don't want to schlep 17 crock pots and 5 toasters back to their houses. --Jewish weddings tend to be quite formal, but as far as attire don't stress. Ladies - black dressy cocktail dress, short is fine, but dressier than a sundress. Men - tux or dark suit are preferable. If they don't have one, sport coat and dark pants is fine. --There will be no pork or shellfish - guess that limits the 'Bride and Groom's surprise' option! Though it would be quite a surprise if they brought our bacon wrapped shrimp....quite a bride and groom's surprise! Hmmmm....Jewish friends and family...what did I miss??? 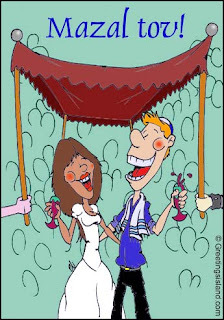 The kiddushin (betrothal ceremony) takes place under the huppah. It begins with greetings, a blessing over the wine, and a sip taken by the bride and groom. Next come the rings: The groom recites an ancient Aramaic phrase as he places the wedding band on his bride's right index finger -- the finger believed to be directly connected to the heart. In a double-ring ceremony (not permitted in some Orthodox weddings) the bride also places a ring on the grooms index finger while repeating a feminine form of the Aramaic phrase, or a biblical verse from Hosea or Song of Songs. The ketubah is then read aloud in English and Aramaic. The sheva b'rachot, or seven blessings, consist of praise for God, a prayer for peace in Jerusalem, and good wishes for the couple. The rabbi doesn't have to say all seven blessings. You can honor special guests by asking them to read -- or even sing -- some of the blessings. Nothing says "Jewish wedding" more than the sound of breaking glass. But what's the point? Depending on whom you ask, the breaking of the wineglass is, among other things: a symbol of the destruction of the Temple in Jerusalem; a representation of the fragility of human relationships; and a reminder that marriage changes the lives of individuals forever. It's also the official signal to shout, "Mazel Tov!" and start partying. There's no law putting the man's foot to the task. If you're game, bride and groom can break the glass together with one swift kick in unison.